I first experienced Cream Cheese Mints nearly 20 years ago when we were living in Idaho. My husband was in the Air Force and I went to a baby shower on base where someone had made these delicious little homemade mints. I knew as soon as I tasted one that I just had to have the recipe. So I asked around and eventually snagged it from one of the other wives. I haven’t made them often since then, but I’ve always kept up with the recipe just in case I needed it again. 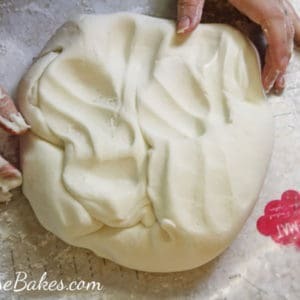 I did a quick search today and apparently a million and one other websites have already shared this recipe, but that’s okay… I’m gonna share it too! Before I get started, let me tell you one quick little thing. I’m sure there are quite a few ways to make these and there’s really no wrong way. My original recipe involved rolling small balls (around 1 teaspoon) and then rolling them in sugar and flattening them with the bottom of a glass. But when searching today, I also saw this method of using a fork to give them a neat little pattern. Personally, I use little tiny rose chocolate molds and this has been the fastest method for me – mostly because you don’t have to roll individual balls. That’s just me… do them however you wish! These mints would be perfect for a baby shower, bridal shower, wedding… you name it! They’d even make perfect favors if packaged in tiny bags or boxes! 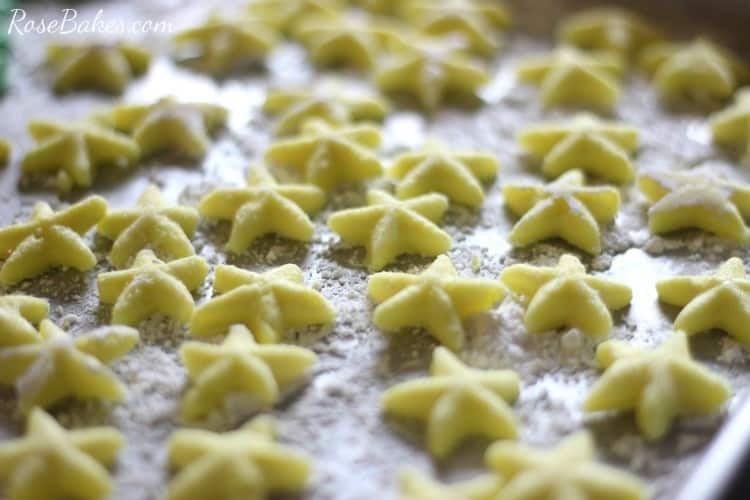 Update Dec. 2015: My daughter decided to make some Cream Cheese Mints for Christmas… stars & trees & wreaths! Have you ever made homemade mints? 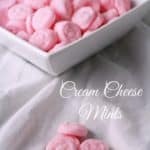 I’d love to learn to make butter mints next! In a mixing bowl, cream together the cream cheese and peppermint extract. Beat it until it’s fluffy, then gradually add in the powdered sugar. Knead in the coloring (it only takes a tiny bit). To make the mints in molds, roll out long snakes of the “dough”, about 1/2″ in diameter, then cut it into 1/2″ lengths. No need to roll these, just dip them into granulated sugar, then press them into the candy mold. They’ll easily lift out (mine stick to the end of my finger). If you have trouble getting them out, you can pop them into the freezer for a minute. *Note: if you don’t have a mold, you can roll them into balls, dip them in sugar and flatten with a glass or use a fork to make a pattern on them. Spread them out on wax paper and allow them to dry overnight. After drying, store in an airtight container. 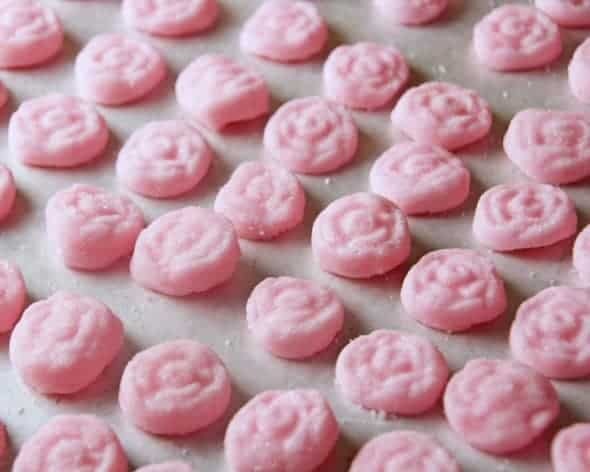 I ended up with 140+ mints doing them this way , but after reading other recipes, I see that most say you will only get around 50-70 mints. I guess it all depends on how big you make them! Oh this is going on my goodie trays for Christmas! Simple and few ingredients….perfect! I’m thinking red and green Christmas colors maybe in a wreath mold? Hmm possibilities are endless for any holidays. Thanks for sharing once again your recipes for yummies! How long can mints be frozen before your event? I’ve kept them for at least a week but I imagine they’d be fine for much longer than that – probably a month! Yummy! My teen son loves the mints! I’m thinking about making this for his 17th Birthday next two months. I’ve pinned this 🙂 In the meantime, I found yours from Marilyn’s Treats: Wonderful Wednesday. These sound so good! Can’t wait to try them. Thanks for linking up with Merry Monday. I love to eat these, but I’ve never made them before. They look so easy (and so cute!). I’m definitely trying them soon!! Thanks for sharing at Delicious Dishes recipe party! Pinned it! Hi Carol, thanks for stopping by the blog. I had the same thing happen to me, and when I asked Rose about it, she said that she leaves them out at room temperature and they crust over. 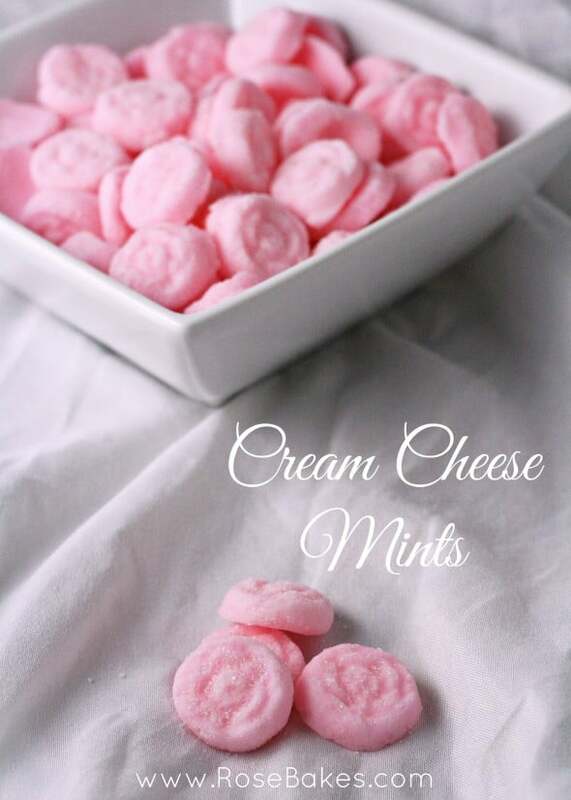 The sugar in the mints keeps the cream cheese preserved for a few days. What is the best type of coloring to use for mints. I can’t say for sure, but I imagine she adds a different extract or flavoring – maybe this Pina Colada flavoring from Lorann’s: https://amzn.to/2IIRzEr (Lorann oils are AMAZING!! ).